Is your message upside down on your website? 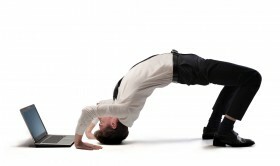 Do website visitors have to bend over backward to figure out what to read or where to click? The best way to organize your website architecture and content is around your core message, making sure all calls-to-action and important information place solidly as high priority on your website home page. Try a quick vertigo test for “upside downess” by giving your 30 second sales pitch to your home page. If none of your talking points are within first click distance or part of your main navigation or obvious calls-to-action, your customers will not stand for it, much less back bend. You want your website to show as much information as possible to potential clients; posting new blog articles, updating product pages with pdfs, spec sheets and filling your database with as much material as it can handle. You don’t want your clients to click out of your website from lack of information. That’s why the vertigo test is important. Too much information is not the problem, but how you organize your information that determines the overall user experience and happiness with your online presence. Your customers don’t want a lot of bells and whistles, they just want to know if your company can solve their problems or address their needs quickly. Ecommerce websites particularly fall victim to upside down messaging as shoppers contort through patched on navigation or layers of pages. They get frustrated if there are no tools to filter and narrow down data to what they need and want. In a brick and mortar shop, the customer can always ask a sales person to quickly find that perfect product. If you want your website to do the same job 24 hours a day/7days a week that your sales staff does offline then you need a website with right side up messaging using simple information architecture, clear user focused navigation, self selecting search and filtering tools, and your best sales pitch front and center. By the way, did I mention that Google and other search engines favor ride side up messaging? If your website needs a flip in the right direction, give us call: 858-677-9931 or contact us here.